Maintrac provides doctors and patients with a way to monitor epithelial tumour cells and deal with tumours more effectively as a result. The cells from solid tumours circulating in blood (CETCs) determine the risk of blood-borne metastases. It is therefore crucial to monitor the response of these cells in order to tailor therapies systematically. Maintrac testing is based on a simple blood sample. The method quantifies the circulating epithelial tumour cells (CETCs) avoiding any preanalytic manipulation of the sample (enrichment for example can lead to huge loss of the respective cells). The technique is highly reproducible and has been successfully audited and accredited according to DIN EN ISO 15189. Numerous peer-reviewed articles on it have been published in high-impact journals worldwide. Maintrac enables the response to different therapeutic measures to be monitored because the number of these cells in the blood correlates significantly with tumour growth and the development of metastases. Tumours consist of heterogeneous cell populations. Chemotherapies and other natural substances may therefore not be effective on all tumour cells. The likelihood of developing metastases increases significantly as a result of rising cell numbers released into the patient’s blood by the tumour. This is why it is important to identify, quantify and characterise the patient’s tumour cells in order to tailor any particular therapy. Patients whose circulating epithelial blood cells are completely eliminated or considerably reduced have a reduced risk of relapse. We can test different chemical and natural agents and recommend which are likely to be the most effective on each specific patient’s tumour cells. The risk of relapse is reduced as long as the number of cells in the blood does not rise during hormone therapy, and may even gradually fall. The proliferative activity of circulating tumour cells depends on the number of their hormone receptors. Hormone receptor blockers such as Tamoxifen block these receptors, preventing cell proliferation. The ability of Trastuzumab to block cell growth sometimes only develops over time. Maintrac allows therapist and patient to track how effectively this is happening whether the effect is setting in, remaining stable, or wearing off. Epithelial antigens called EpCAMs (epithelial cell adhesion molecules) are expressed on cells of epithelial origin, such as cells from solid tumours. These antigens are not usually found on blood cells. This antigen can be stained with a green fluorescent antibody. The live EpCAM-positive cells are detected and enumerated microscopically. This is possible with an additional dead/live staining dye called propidium iodide. All cells that the dye is able to enter due to having a permeable membrane are excluded. Normal epithelial cells are also detected if these are present. However, if the patient has a tumour, it is most likely that the epithelial cells are tumour cells. 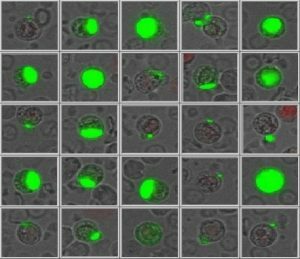 The signal strength of the EpCAM signal on the cells has a high range of variation. 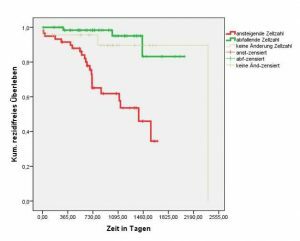 Maintrac can also detect cells with very low EpCAM expression and these may in some cases be the most significant indicators of metastasis (the epithelial-mesenchymal transition leads to loss of EpCAM). Repeated measurements provide highly comparable results. 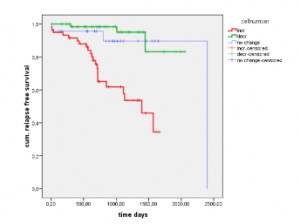 In the example shown, three parallel samples of the same patient show almost identical results that remain constant over time. Duplicate assays for more than 80 patients showed an excellent correlation. Patients with increasing cell counts during therapy have a higher risk of relapse (red Kaplan-Meier curve) than patients with decreasing cell numbers (green Kaplan-Meier curve). This allows timely adjustments to therapy. Please note that it is known that tumour cells can downregulate their antigen expression, including the epithelial surface antigen (EpCAM), during increasingly aggressive growth or the so-called epithelial-mesenchymal transition (EMT). 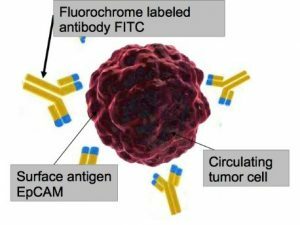 This would imply that they may become less detectable or even undetectable for our approach that uses an antibody against EpCAM to detect cancerous cells in blood. 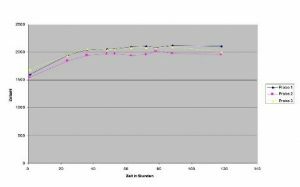 In this case we not infrequently observe – after an increase in cell numbers – a sudden decrease to below our detection limit. Under these circumstances we would recommend turning to imaging, and you may wish to consider Stemtrac, which is used to identify cancer stem cells. We strongly suggest patients remain under the care of their oncologists at all times.